John P Matthew on Writing, Book Reviews, and the Writing Life! : Luke R.I.P. View video: Why I Wrote "Mr. Bandookwala, M.B.A., Harvard"
Just as I am about to leave for Kerala today news comes that my friend Luke, handyman, friend, died. Hr fell down and just died. I whine in disbelief as my wife tells me this. Yesterday I had discussed some urgent repair work on the house with him. And here he is: no more. Gone from this world. Luke was Sri Lankan and I have been wanting to write a short fiction about him, his English, his gentle personality, his lack if guile, his readiness to help any time. This was a series of short fiction I am planning on the South Asian diaspora living illegally in India. I have already written on a Bangladeshi migrant. Why he left a comfortable life in Negombo, Sri Lanka, to work in a remote valley in a satellite city is beyond me. I had visited his native town of Negombo when I had gone on a visit. We discussed its beaches, its people. His brothers are business owners he tells me, placed highly in the island nation. They had come to India to take him back. At the airport he ran back, out of the terminal, away from where his brother waited for him, to the country he had no wish to leave, because he loved that country. He said many times that he loved India. Now he is no more. He was walking on the street. He fell down and died. He had long greying hair, a bulky body used to working, and the softest expression in his eyes. I remember his face clearly from our meeting yesterday. He had said, "you come back no, then I do your work, little, little, money give me anytime, no worry, only you be satisfied wid my work." Those were his parting words. P.S. I wrote a first person short story on Luke here. Do visit, read, and "share." Gleanings of my published works! Twelve years of your love! Keep love going, subscribe! Why BT Cotton Farmers in Vidarbha Are Committing Suicide! Will GMOs Be Approved in India? This Blog Reaches 599th World Rank for Books! This is self promotion! I have always blogged about books. Proud to rank among the top book blogs (599th) in the world. John P. Matthew (That's me!). Interviewed by David Binder. I am a regular contributor to the Indian Section of Johntext . My Fan Following: Be one! 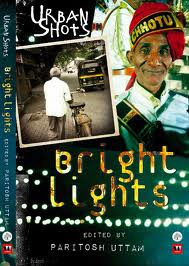 Urban Shots - Bright Lights My short story "Mr. P.K.Koshy's Daily Routine" has won the Urban Shorts -- Bright Lights -- competition and has subsequently been published. I am the discoverer and active promoter of "Mack English" (a.k.a. "Maka Pao English") the English of Bombay provenance. Read my short story (Anaida) and this poem (Mack English)written in this patois unique to the West Coast of India. 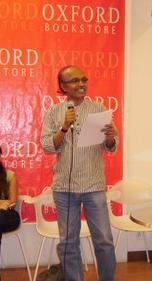 Reading my poem "The Ladies Special Train" at the 100 Thousand Poets for Peace event in Bombay. Writers are landing book projects based on their blog contents. Therefore, I hasten to add the Creative Commons Licence here to protect my more than 700 articles. Johnwriter"s Literary Show! HEAR FAMOUS AUTHORS IN THEIR OWN VOICES! Click on the links below. Windows Media Player will open up and play the file. Don't have WM Player? Download here. * Arvind Adiga The White Tiger. * Amitav Ghosh "The Hungry Tide"
* Salman Rushdie "Shalimar the Clown"
* Arundhati Roy "Public Power in the Age of Empire"
* Kiran Desai "An Inheritance of Loss"
* Vikram Seth "An Equal Music"
* T S Eliot "The Love Song of J Alfred Prufrock"
* Charles Bernstein "Don't Get Me Wrong NY"
* Namdeo Dhasal "Malahi daridryachi svatantra seta ahe"
* T S Eliot "Wasteland"
* Charles Bukovski Charles Bukowski reads his "Friendly Advice To A Lot Of Young Men"
John Matthew "Vision Outside My Office Window"
Meena Alexander "The Green Parasol"
Thanks for giving me so many hits!